I have had a rather strong link to Glen Eden for over 30 years. Back in 1988 I decided to open a law office. The premises at 208 West Coast Road were central, comfortable, available and cheap and I rented a room. Since then through gradual growth I have taken over the other rooms and now occupy the floor. The neighbourhood was and still is really good. The immediate vicinity was surrounded by other businesses owned by people trying to make a living. There were no chain stores and nothing flash but many in the business area we’re getting by and doing ok. The suburb was full of good old sorts. Ordinary families who had set up home in Glen Eden many years ago and then worked to build a community. There were the churches, the Glenora Rugby League club, the Playhouse. The sense of community was very strong. Since that time there has been gradual change. The railway station has been improved and the old station moved into place many years ago. A new library and community hub were constructed. The 3 Guys supermarket was closed and replaced by the buildings to the rear of the shopping centre. But the pace of change has quickened recently. It is clear however that more recently major change is happening and more is just around the corner. Public transport usage is surging. The double tracking and electrification of the rail have caused significant change. Last year there were over 650,000 train boardings and alightings through the station. In 2014 there were 427,000. And Auckland City is growing quickly. It is predicted that by 2031 the current population of just over 1.6 million will have increased to 2.2 million. Auckland has two options, grow out or consolidate. Growing out creates all sorts of problems, such as taking up our fertile areas and the Waitakere Ranges as well as increasing congestion and the expense of running the city. Sprawling cities are inefficient and unsustainable cities. The cost of infrastructure is higher and because everyone has to drive further congestion is a feature. This is why Council has decided, and I agree with the decision, that Auckland should consolidate with up to 70% of future growth in the forseeable future occurring within existing boundaries. To make this work the intensification has to be concentrated in those areas where there is the greatest potential for improved transport network performance. And this is on the public transport routes, particularly on the train lines. This is not some academic theory. Big cities overseas such as London, New York, Beijing, Shanghai and Tokyo have shown how growth can be handled. And Los Angeles shows why over reliance on the car for transport does not work. China and in particular Shanghai has shown what is possible. In order to address out of control air pollution and congestion China has been on an underground metro binge since the early 1990s. Shanghai is at the forefront of these efforts and now has 640 kilometers of underground rail after opening up its first metro rail line in 1993. To put this into perspective Auckland’s city rail link currently being constructed is 3.4 kilometers long. It is clear to me that to handle growth you have to put in place quality public transport, preferably train, that can move large numbers of people quickly and efficiently. Which is why the city rail link is so important. 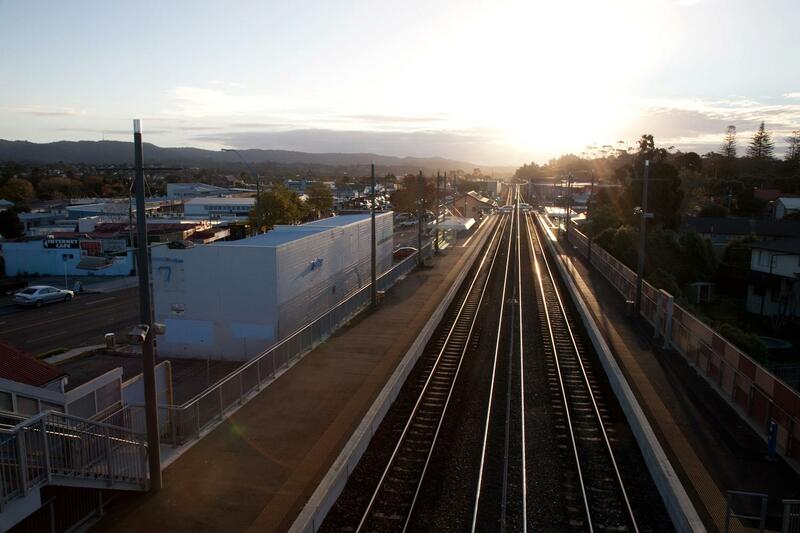 Glen Eden is one of the areas the city rail link will benefit the most. When it is finished train trips to the centre of the city will take only 35 minutes and the train frequency will be every 6 minutes. I can’t imagine many people wanting to do this trip by car when the link is in place. And already development in anticipation of growth is happening. The Ted Manson Foundation towers are being built right now and are expected to be completed by June next year. And Housing Corp is intending to start the construction of another apartment block in Glen Eden in early 2019. This is why I believe Auckland Transport’s current plan to upgrade and slow down traffic through Glen Eden is a welcome and important step to take. The area is too car dominated. Making the area more people friendly and safer is an imperative. Following are some photos showing what is being consulted on. This is the West Coast Road Captain Scott Road intersection. This is further down the road showing Glenview Road. And this is the Glendale Road intersection. There are few aspects of the proposal that have already attracted comment. One question that has been asked is where are the cycleways and I agree. There may be a case for the local board to supplement the spend with some of our own transport capital project funds to make sure that cycleways are installed now although clearly my preference is that Auckland Transport pays for this. The local board’s draft greenways plan should be incorporated into the design work. Safe pedestrian crossing over Glenview Road from Waikumete Road is important. Currently people take their hands in their lives when they cross this area. Safety improvements in this particular area are vital. People are worried about parking. My understanding is there will be limited loss of parking further up by the Wilson Road intersection and this project will not cause other parking spaces to be lost. I should acknowledge that in the longer term the loss of car parks inevitable. Land will become too valuable to be the preserve of a single car for extended periods of time. I am sure there will be other concerns and other proposals for improvement. The consultation ends on September 9, 2018. Feedback can be provided online here. Hi Greg, Definately needing better traffic management (inclusive of cyclists – maybe a shared walkway space like tamaki drive) and longer term overall better town planning. There is so much opportunity (driving by currently) just waiting for a better designed precinct with a nice green space. Build it and they will come ! Thanks Charlotte. Will definitely push the Greenways plan with AT and will work out how to amalgamate both.